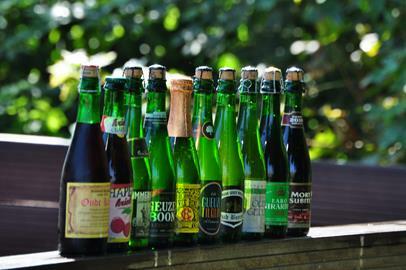 Lambic is the base component for a spontaneously fermented beer made with wheat and barley malt. During the boil of this brew known as wort, aged hops are added. The wort is then poured into what is called 'coolship', a large shallow open-air vessel, to cool. During this cooling process, wild yeasts in the open air inoculate the wort and trigger a spontaneous fermentation. Those wild yeasts causing the fermentation processes are found in high concentrations only in the Senne valley and the Pajottenland region. Afterwards the lambic matures in oak casks for one or several years. Oude Geuze is a blend of several lambics that were fermented in oak barrels for one, two and three years respectively. The unique lambic blend is bottled and then stored in a cool cellar, where it undergoes a second fermentation in the bottle, giving rise to Oude Geuze. After at least six months of refermentation, you can refer to it as Oude Geuze. When stored properly, Oude Geuze can be kept for several years before being drunk. Over time the taste becomes more complex and the sourness less pronounced. Oude Kriek is a lambic-style beer that has sour cherries ('Kriek' cherries) as a key ingredient. Whole sour cherries are added to a cask of young lambic. Gradually the sour cherries start to ferment, thus creating cherry lambic. This cherry lambic is then blended with lambic that was fermented in wooden barrels for a longer period. The lambic blend is then bottled to go through a second fermentation. Faro is the original name for lambic that has been sweetened with sugar candy. Before the emergence of soft drinks, faro was particularly popular among children and women, because of its sweet taste.